What do those blood pressure numbers at the doc's office even mean? What do those blood pressure numbers at the doc’s office even mean? The doc does a few quick squeezes, reads the numbers, writes them down in his or her Very Important Doctor’s Notes, then goes on with the appointment. Let me set the scene: You’re in the doctor’s office with a blood pressure cuff around your arm. Uh, hold on a sec-what were those numbers? Were they normal? And what does that even mean? Consider this a mini-lesson on what those blood pressure readings mean (so, you know, you don’t have to just smile and nod next time). First things first: What is blood pressure? Basically, blood pressure measures the strength of your blood moving through your body. But a stronger force doesn’t necessarily mean “healthy”-in fact, you want a more gentle flow, says Susan Besser, M.D., a primary care provider at Mercy Personal Physicians in Baltimore, Maryland. “Imagine your body is a garden, the blood vessel is the garden hose, and your blood is the water. When you water your garden, you turn on the hose and the water comes out in a gentle stream-that’s normal pressure,” she says. And, just like a hard, fast flow would basically demolish your plants, it can cause damage to your organs. “In your body, the increased force physically pounds the organs which causes damage” says Besser. Okay, so what do blood pressure numbers mean? You’ll hear your doctor read two numbers to you, likely one “over” the other. The top number refers to systolic blood pressure, or the pressure to deliver blood from the aorta to the rest of your body-the outgoing flow-explains Niece Goldberg, M.D., a cardiologist and medical director of the Tisch Center for Women’s Health at NYU Langone. The bottom number refers to blood pressure between pushes, when blood vessels and the heart are relaxing and the heart is filling with blood-the return flow. In November 2017, the American College of Cardiology and the American Heart Association actually updated the goal numbers for blood pressure (the first update since 2003), calling out 120/80 or less as normal. They lowered the numbers in hopes that more people would get earlier treatment for hypertension. So, if you have a reading between 120-129 over 80, then you’re considered to have “elevated” blood pressure, Kovell explains, and 130 or above means you’ve got hypertension (a.k.a, the technical name for high blood pressure). Why is high blood pressure so bad-and how do you treat it? 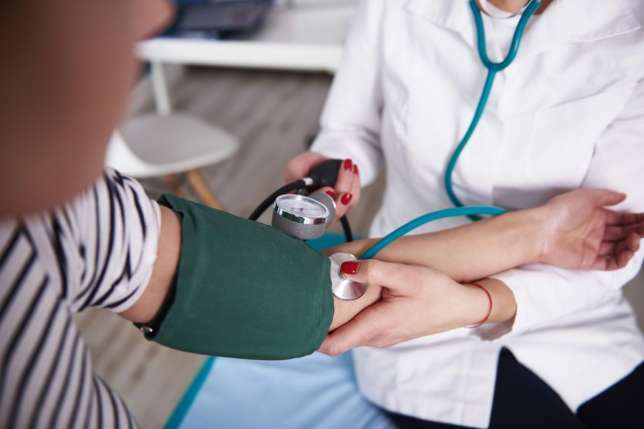 There are a few pretty convincing reasons to get that high blood pressure (if you have it) in check: “Over time, high blood pressure can cause damage to the arteries and increase risk for stroke, dementia, heart attacks and other heart disease, and kidney disease,” says Kovell. Even scarier: Many people don’t know they have high blood pressure. “Hypertension is a chronic disease, and it is also known as the silent killer since it is not always associated with obvious symptoms,” says George Thomas, M.D., who specializes in nephrology and hypertension at the Cleveland Clinic. If you have just one high reading, it’s not as much of a concern-lifestyle changes like lowering salt intake drinking more water, and being active are quick fixes. But if you have a very high reading (like 160/110 or above), you might need to go on medications right away, and the same goes for someone with heart disease or diabetes who gets an abnormal reading. What about low blood pressure…is that a concern? If you’re young, healthy or extremely active, then likely not, says Goldberg. “Low blood pressure is more about how the patient feels,” she explains. You could feel lightheaded, dizzy or fatigued from it, in which case you probably need to throw back more water. You could also need more salt in your diet or more regular meals. Thomas also mentions that if you previously had a regular reading, and all of a sudden your blood pressure plummets, you probably need to get checked out ASAP. How often do I need to get my blood pressure checked? At least once a year, right along with your annual physical-that is, if you have a normal number. If it’s in that elevated range, then get it checked every three to six months, says Thomas. Those with hypertension will want to get a reading every month until it comes down. Goldberg mentions people with high blood pressure might even consider getting an at-home monitor to keep an eye on it. Basically, though your blood pressure reading is just two small numbers, it means a lot for your health. So the next time your doctor tells you, pay attention. And if your doctor doesn’t tell you your reading and just writes it down-ask for it, dammit!